The number one reason people fail with blogging is that they fail to have a content plan. You need to start planning your blog content. It’s that simple. A content plan is the number one thing standing between you and serious success with blogging. Most people don’t have one, and those do don’t usually do it properly. I always have a content plan, I keep it updated all the damn time, and it is an essential part of how I work. In this article, I’ll tell you why you need to a blog content plan, I’ll tell you how to do it, and I’ll explain how to use it properly. Let’s get started! What is a blog content plan? A content plan is the most important tool in your blogging arsenal. I’m serious. It’s not WordPress, it’s not some plugin, it’s not your autoresponder, it’s your content plan. Because if you don’t have a content plan, you will fail. You’ll run out of ideas, you’ll stumble, you’ll lose momentum. And your blog will join the legions (millions and millions) of blogs with two posts from three years ago: one saying “Hello World, this is my first WordPress post”, and another a day later saying “Can’t wait to get started with this blog!”. Don’t be one of those people. Start a content plan! A content plan is a schedule of potential upcoming blog posts. The big mistake people make when blogging is that they sit down at the WordPress editor (which by the way is the worst place to write blog articles, I’ll talk about that another day). And then they can’t think of anything to write about. So they start reading Facebook, looking for “inspiration”. 40 minutes later, it’s time for a coffee, then 40 minutes later it’s time for Netflix, and the day is over. Thanks for playing. If you are staring at an editor trying to think of an idea for an article, you have already lost. Don’t give up though, start again. Work on your content plan. The idea is that you always have an idea for what to write next because your content plan tells you what to write next. If you’re wondering what tool to use, don’t stress. Keep it simple. I just use Google Sheets, and it works perfectly well. I can access it anywhere, it’s backed up automaticaly, and it has a pretty rich interface. And it’s free! You can’t go wrong. Why do I need a content plan? Your blog content plan serves multiple purposes. First and most importantly, it provides ideas for articles. You think of an idea, you put it in the content plan. Always. For example, while writing this article, I thought of an idea for an article! Just a few paragraphs ago, I mentioned how the WordPress editor is a bad place to write blog articles. I have built up a neat workflow and system of tools for writing articles. WordPress is the last place the articles end up. Then I thought “hey I could write an article explaining my workflow for writing and the tools I use”. So I jumped straight into my content plan (which is very fast and easy to access from multiple locations) and added it! That’s the magic of the content plan. When it’s time to write an article, you don’t start by thinking of an article. You just go to the plan, and there is a big list. Pick one and start writing straight away. I would not recommend starting a blog until you have at least 10 ideas for articles in your blog content plan. And if you are adding one or two a day, which should be easy (I’ll soon tell you how you can hundreds per day if you want), you will never, ever run out of ideas for articles. 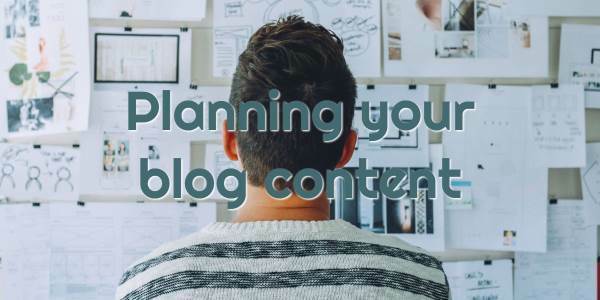 A content plan doesn’t just give you a list of ideas to write: it also helps structure your overall plan for your blog. One of the most important aspects of your blog is its categories. In fact, you should think of some categories before you even start your initial 10 article ideas. Your categories are simply the sorts of things you’ll talk about on your blog. For example, the current categories for my blog are General Marketing, Affiliate Marketing, Blogging, SEO, Funnels, Reviews, and Email Marketing. Don’t stress about these too much. The important thing is, they can change over time! You can easily add more later as you think of them. You don’t have to get it all right the first time. Just think of three or four as a start. Then, start putting your ideas in these categories. The categories themselves might help you think of article ideas. If you are still struggling, there are plenty of ways to use the categories to drive article ideas too. Leon’s pro tip: your content plan can also help you capture leads! As you think of your article ideas and categories, think of a super useful piece of content that you could offer as an upgrade to that content and category. For example, if one of my categories is SEO, and I think of article ideas like “guide to off-page SEO”, “misconceptions about SEO”, “guide to on-page SEO”, I could decide to offer an “on-page SEO checklist” as a lead magnet. I could offer it against the “guide to on-page SEO” at the very least, and maybe offer it on the other SEO pages to. At least until I come up another SEO related lead magnet that might work better with those posts. You should think of at least one lead magnet for each category for your posts. If you can think of a more specific one for a specific article in that category, that’s even better. Put the lead magnet next to the article name for each idea in your content plan. If you’re stuck for ideas, there are so many ways to come up with more. I currently have about 1000 ideas in my content plan for this blog (no joke). And it took me less than an hour. There are a number of tools you can use for this. My favourite is an amazing website called Answer The Public. I’m not exactly sure how it works but I think it aggregates the google “related searches” for a keyword. These are the search suggestions that Google provides at the bottom of the SERPS. You just put in any keyword you like, click a button, and it will generate a huge list of keywords based on that seed. What I do is I think of my initial categories. Then for each one, I put it into Answer the Public, click Get Questions to get the results, then click Download CSV. Now I copy the CSV and save it into a tab in my Google Sheets file (I have a General tab which is my current main list of good ideas, then I have a “warehouse” of ideas on tabs for each of my categories). Doing this for just one keyword will give you hundreds of ideas for articles. Some of them might not make sense (they might be in another language, or just be a stupid search), but most of them will be fine. And these are actual search phrases that real people are using! Not some random keywords that the Google Keyword Planner is suggesting (I recommend to NEVER use this tool for article ideas). Now do it again for your next category name, and you’ll have hundreds more. Each of my category keywords gave me a list of about 800 article ideas, about 300 of which were good enough to use. So I have about 1000 just from half an hour or so of work, plus a few that I had already thought of. This will keep you going for years, even if you are publishing one blog post per day! Another popular tool is Buzzsumo. This lets you search for viral content: how much content is being shared. You put in keywords, and it returns a list of content that matches the keyword that has a lot of social shares. Some people swear by this tool, and it has some interesting features (though most of them are restricted to an expensive paid plan). I don’t use it much because I find that often the shared content is not at all the best content, and often people share things without even reading or interacting with them. All the clickbait stuff on Buzzfeed comes to mind. But if you want to try Buzzsumo, go see if it works for you. You can also just do things the old-fashioned way: do a google search and see what comes up. Check out the Related Search sections at the bottom of the SERPs. Or do a site: search for a big forum or blog in your niche. I find Answer the Public to generate results similar to this but in a much more efficient way though. You can also use keyword tools like Keyword shitter, Google Keyword Planner, and so on. Keep in mind thought that these tools are often focused on advertiser keywords, which is not necessarily what you are looking for. Advertisers are nearly always targeting short and medium tail keywords that they can’t or won’t rank on SERP page 1 for. You usually want to be targeting long tail keywords that you can rank for without much difficulty. The actual planning is pretty simple. I have a main tab with my latest best ideas, 30 or so. That’s where I go when I need to write an article idea. When I publish an article, I put a link next to it, which marks it as done and also provides a handy quick repository of article links. So if I need to chuck a link to one of my articles quickly (in a forum or reddit or whatever), I don’t need to dig through my blog search or WordPress dashboard or whatever, I just bring up Google Sheets (which I pretty much always have open anyway because I use it for pretty much organizing my entire life), and there are all my articles and links. When my main tab gets low on un-published article ideas (down to 20 or so), I just go through my keyword tabs (which have hundreds of ideas from Answer the Public and elsewhere), and pull in a few good ones. Make sure to remove them from the keyword tabs so they don’t get used twice. Also remember to put them against a category, and choose a lead magnet. That way, your posts are all organised. If you think of a lead magnet but don’t actually have that lead magnet yet, that’s fine! Put the lead magnet idea in, and mark it in some color. That way you have a visual reminder that you need to create this lead magnet in the future. In the meantime, just use the next most relevant lead magnet for that blog post category. Don’t forget to keep it updated! Whenever you think of an article idea, put it in the plan. If you decide some ideas are dumb or no longer relevant, delete them. If you think of a new category, add it! Create a new tab, do a keyword search, and dump the good ideas into the tab. Think of a new lead magnet and away you go. If you follow this system, you will never, ever run out of good article ideas for your blog. I hope you found this article interesting and helpful. Do you have any other ideas or experiences with content plans? Or questions about the system I’ve described? Please let me know in the comments!